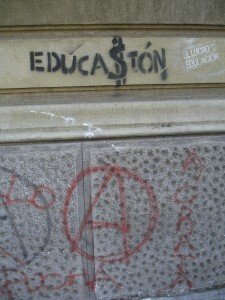 Tens of thousands of students returned to the streets of Santiago last week to renew their demand for education reform. It’s one year since students in Chile began the greatest wave of popular protests since the end of military dictatorships in Latin America. High school and university students joined together to demand free public education. Panos reporter, João Paulo Charleaux, who was based in Chile, followed the struggle of the Chilean students, covering their demonstrations, arrests, parties and endless rounds of negotiation with the government. Here he presents a series of photos, video and words looking back on the months of marches. He met students from around the country to ask why they were protesting and what they hoped to achieve. Young people never know when to stop – thank God! 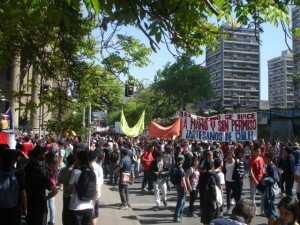 For more than a year I’ve been accompanying the huge wave of protests that the students in Chile have been holding. In a tiny country, in the south of South America, thousands of young citizens have been raising their voices to ask for free public education, for the right to study, to go to school, to go to a university without being economically punished. Despite the violence the state insists on using against them, and despite the relatively small amount of attention they have had in international press, Chile’s youth go out on the streets to shout for what they believe in. As many as 100,000 students – both from high schools and universities -joined the bigger marches. 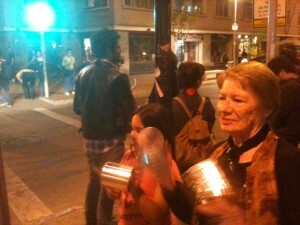 Most of protests were peaceful, with “kiss-ins”, fancy dress costumes and music. However, violence flared at times between riot police and demonstrators, particularly with small anarchist groups. Police retaliated with tear gas and water cannon. 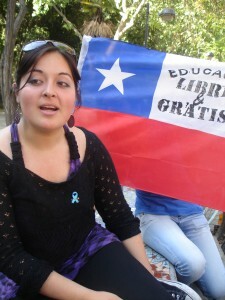 Paloma Galleguinos is a Chilean student who, like thousands of her fellow students, has struggled to fund her studies. 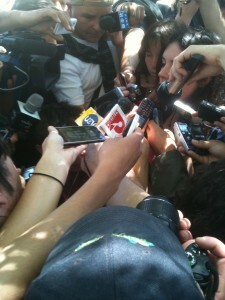 She was in her third year of an Industrial Design course held at one of the most prestigious Chilean universities. She came from a public high school. The government pays a third of the total price of hercourse – almost US$8,000. She has taken out a loan from a private bank to pay the difference. But she has had no time to work while studying and fears she won’t be able to find work as soon as her studies have ended. Last year Paloma decided to occupy her university building to alert the public to the reality of her and her fellow students’ predicament. “I feel the protests are all about me and about people like me, people who may see their right to education denied due to economic reasons,” she told me. Many demonstrators bring children to the protests, despite the risk of confrontation with the police. Chile had one of the most violent dictatorships from 1973 to 1990. Now, a new generation is discovering freedom of expression on the streets. This banner reads: “I came today so I don’t have to come tomorrow.” Student protestors did not achieve all their objectives, but they forced the government into negotiations and contributed to a dramatic fall in President Sebastián Piñera’s approval rating. Last week Piñera appeared on national television to outline tax reforms expected to raise around US$700 million, much of which will be funnelled to the country’s education system. Only 45 per cent of high school students in Chile go to state-funded schools, while nearly 40 per cent of all education spending comes from tuition fees paid by ordinary Chileans – the highest rate anywhere in the world according to the Organisation for Economic Co-operation and Development. Here one demonstrator stripped off in front of the police in the streets of Santiago. Most protests had a playful, peaceful atmosphere. However, over five months last year police detained more than 1,800 demonstrators. On May 19 last year, more than 150,000 people joined the 109th march of the year, pictured above. 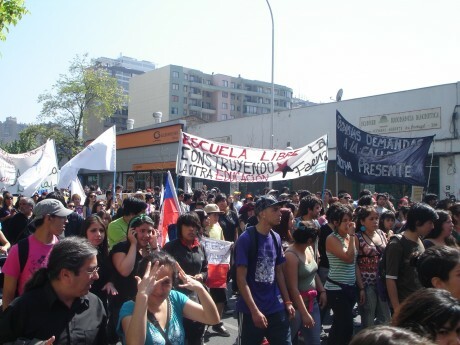 Students and social movements gathered the support of almost 90 per cent of Chileans in their demands for lowering the price of education and strengthening the role of the state in secondary and higher education. The indigenous Mapuche students (indigienous inhabitants of south-central Chile) suffers from double discrimination: both for economic and racial reasons. 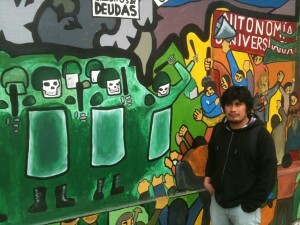 The Mapuche students are at the very bottom of Chilean society. 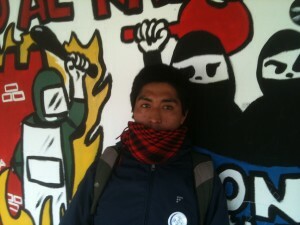 Angelo Tranamil is 24 years old and comes from a poor Mapuche community. He says he never felt integrated into the student community. Police repression is even harder against the Mapuche. Despite the fact that he receives a partial scholarship from the government, he will have to pay for almost 50 per cent of his studies (US$24,000), even if he goes to a public university. “I will never be able to pay for that,” he says. Luís Antiné is 25 years old and studies agronomy (the science of producing and using plants for purposes such as food and fuel) at the public university in Temuco city. He came from a poor Mapuche community called Lonquimay, where his family have some cattle. Antiné is the first generation to go to university in his hometown, but the racial and economic differences make him feel discriminated against. He thinks the protests are the only way to change this sad reality, despite fearing violent responses from the local police. Last October police invaded the students’ dormitory. He says they used tear gas bombs in the middle of the night and took away Mapuche protesters. 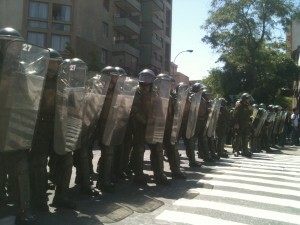 Here anti-riot police prepare to repress a group of demonstrators in the center of Santiago during a march on October 19. In only two days, almost 300 young demonstrators were arrested by the police. Repression and state violence have been used as a rule by the government to try to contain the protests which brought the popularity of the Chilean president Sebastián Piñera to the lowest ratings of any Latin American president – at one point just 22 per cent. Rebeca Errazuriz, 30, pictured above, had just finished a doctorate in Latin American studies in Brazil. 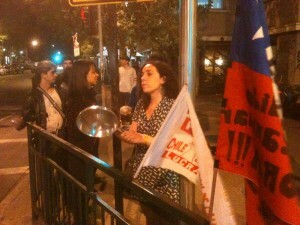 But she came back to Chile to join the protests. 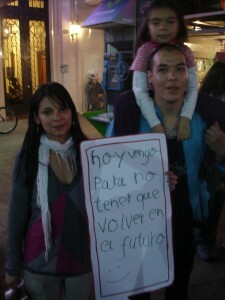 She has finished her studies in Chile but still has debts of more than US$8,000. “I decided to take part in the protests because it’s about my own history and thousands more similar histories from all over my country,” she told me. Young demonstrators destroy traffic signposts during a march in the centre of Santiago. The massive and peaceful demonstrations held by the students often ended in public disturbances organised by small anarchist groups. What have these students achieved after so many protests and clashes? Can a group of youths change the reality of a country that, according to the UN, has perverse and unequal educational systems?Some students, like Alfredo Andres Vielma, 17, were punished for having participated in the protests. Due to go into his fourth year of college earlier this year, Vielma had his registration denied by the school management. He says more than 30 students from his school are in the same boat after Pablo Zalaquett, the mayor of Santiago, told the director of the school not to accept back students who had protested. The Arab Spring is now cool, while Latin American social movements became quickly old-fashioned. But Chile is now what many of these Middle Eastern countries dream of some day becoming. The Chilean population was once also repressed by a brutal regime exerted by a cruel dictator, responsible for widespread killings, torture and forced disappearances. The youth in Egypt, Libya, Bahrain, Syria and elsewhere will soon discover that formal democracy is not enough. And then they may search in school books for the lessons the Chilean students are now teaching. Interesting piece on a story not covered (to my knowledge) by the mainstream media. (Only marred by a number of typos, including “Satiago” in first line – suggest someone proofreads it!) Keep up the good work in discovering untold stories. Oops, thanks for the comment Juliet – and for the typo reminder – someone is ironing this out right now.